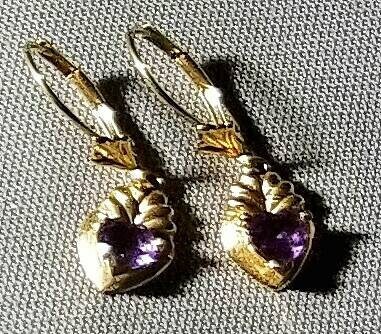 Pair of 10K Yellow Gold Amethyst Dangle Style Pierced Earrings with a Lever Style Earring Fastener. Pair of 10K yellow gold dangle style pierced earrings with a lever style earring fastener. Each earring is set with one amethyst gemstone. Attached to each earring is a lever style fastener. The pair of amethyst earrings come in quality earring box.